While in Lapeer on a little photo escape we stopped by the former Lapeer Michigan Central Depot. 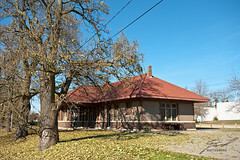 The building now houses The Lapeer Agency and the right of way is now a rail-trail. On the trail side of the building I spotted a benchmark -- P 31 placed in 1930. It's the first I'd seen mounted sideways in a building. Very cool.